FBI Director Christopher Wray says he feels no undue pressure from President Donald Trump when it comes to the Russia investigation. 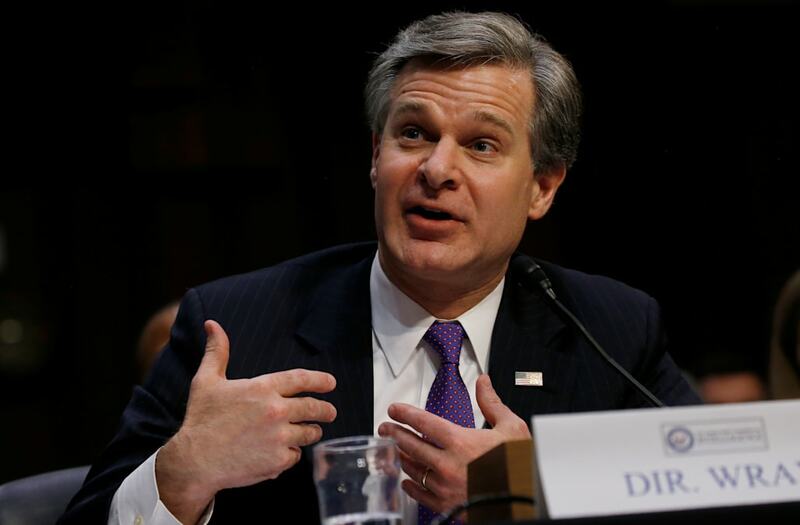 Wray sat down with NBC News on Tuesday night to offer some insight into how he views his role at the FBI, which has been one of Trump's central targets in his frequent attacks on the probe of Russia's meddling in the 2016 US election. Trump has publicly castigated senior officials in the nation's top federal law-enforcement agencies because of his resentment toward the Russia probe — most notably going after Andrew McCabe, the former deputy FBI director who was forced out, and later fired, amid Trump's blistering broadsides. When asked whether Trump had tried to sway him in any particular direction, Wray said: "He never asked me to do anything with the Russia investigation." FBI Director Christopher Wray said he does not feel any undue pressure from President Donald Trump about the ongoing investigation of Russian meddling in the 2016 US election. "He never asked me to do anything with the Russia investigation," Wray said in an interview with NBC News on Tuesday night, just four days after his former deputy, Andrew McCabe, was fired, hours short of his retirement. The question of undue pressure is particularly germane to Wray, a Trump appointee who replaced James Comey after the president fired him last May, because Trump is entrenched in a long-playing power struggle with some members of the federal law-enforcement community. Trump's public resentment about the Russia investigation has prompted the president to throw rhetorical darts at several senior officials over the past year, including Attorney General Jeff Sessions, Deputy Attorney General Rod Rosenstein, McCabe, and, more recently, special counsel Robert Mueller, who Trump called out by name for the first time on Saturday. "I have been very clear from the minute I was nominated to the minute I walked in the door to countless opportunities since then that I am always unwaveringly committed to doing this job by the books, independently, following our rules and processes free from political or partisan influence," the FBI director said. Wray's words carry additional weight this week, with special counsel Mueller making strides in the multiple threads that comprise the Russia probe. The FBI director's resolve has already been tested, according to a January report from the news website, Axios, which said that Wray threatened to resign over pressure he received from Sessions and Trump to fire McCabe. But when asked Tuesday night about that alleged incident, Wray said "I'm not going to talk about specific conversations."